There’s one thing I always wanted to do : drag a mask. Actually, that’s how I got on kirupa.com first. I found that dragging mask tutorial, that surely you all completed since it’s very easy and looks fantastic. But one day, it just hit me in the eye : in that movie, we’re not dragging the mask ! We’re dragging what is masked by the letters ! We see the spot through the letters, but never does the mask move. Suprabeener the Great told me after that that you CANNOT drag a mask, nor get its position, scale, or anything else. So why did you name your tutorial drag mask tutorial, then ?, will you ask me. Good question. That’s because I added FAKE in front of it. We are going to simulate the drag. So, hum, how could we do that ? If we can’t move the mask, we’re going to have to move the background. Hold it ! you say. That’s just what Kirupa did ! Yes, but we are going to do that a little bit differently. So stop interrupting me all the time. So we are going to drag the background. But not only do we have to drag the background, we are going to have to simulate the drag of the mask : we are going to put everything inside a draggable movie clip!! To make this animation easier on you, I have provided a partial source file that you should use to follow along. Click the following link to download the source file. If you open the source file, you’ll see me, during my last holyday, warming up in the morning, with a black spot next to me. 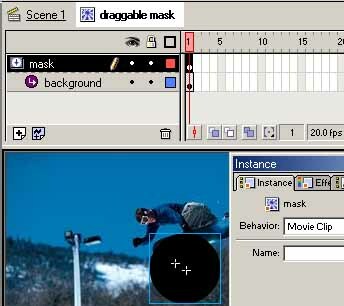 If you double click that image, you’ll find that it is called “draggable mask” (it appears next to “Scene 1” on the top left of your screen and it means that you are editing the object called “draggable mask”). There are 2 layers there : “mask” and “background”. “mask” is the black spot movie clip (called “mask”), “background” is the surfer movie clip (called “background foto"). You can notice that “mask” is centered (see the tutorial “Pool of square” to see how to use the align tool). We have one movie clip containing two movie clips. If you’ve understood really well the idea behind all this, you’ll see that we are going to drag the movie clip “draggable mask”, that “mask” is going to be our mask, and that it won’t move, and that “background” is going to have to move somehow. Test your movie. What do you see ? A circle showing one bit of your picture, and following the mouse. The code tells Flash that when the clip is loaded, he can be dragged (this refers to the current object, and true refers to the fact that it must lock mouse to centre). What do we want ? We want to see, for instance when we go down, to bottom of the background. All we have to do then is to make the background go up by the exact same amount !!! We are going to use action script to do that. Edit the “draggable mask” movie clip. Unlock the background layer. We need to give the background an instance name (it has to be a movie clip to do that). Open the instance panel and name it “back”. Lock the layer again. Go back to the scene 1. So what’s the difference ? When the clip loads, we initialize 2 variables posx and posy as the current position of the movie clip “draggable mask”. On every new frame, we set the x and y position of the background to the opposite of what we have moved. If we go up by 5, we want the background to go down by 5 to simulate the dragging. Save your work. That last bit of code might look strange to most of you. That is much more convenient than the tellTarget() syntax that we could have used in this situation instead. The movie clip “back” is located inside the movie clip where we have put the code, so we access its properties directly (I mean by that that we don’t have to use any of the _parent. or _root. things). Posx - _x : _x now refers to the location of the current object, that is to say the “draggable mask” movie clip. _x is equivalent to this._x here. Test the fla. Everything should you be working. There’s something I haven’t been able to figure out though : if you centre the background and the mask, the masking isn’t perfect, but when you put the mask somewhere else that right in the centre, it works nice and smooth. I hope the information helped. If you have any questions or comments, please don't hesitate to post them on the kirupa.com Forums. Just post your question and I, or our friendly forum helpers, will help answer it.